A light that helps with anti-aging? Really? Call us a little skeptical but how is that even possible? LED Light therapy, is a completely non-invasive anti-aging treatment that works by sending light deep into the layers of the skin to boost cell turnover, target uneven skin, treat lines and help with overall skin rejuvenation. In fact, research indicates LED light therapy helps with wound healing, an important part of the collagen production process. If you’re like us, and you’re a bit of an anti-aging fanatic you’ve learned that light like the type from tanning beds and the sun do the opposite of helping and actually damage skin. To make the most of the anti-aging benefits, LED light therapy devices should be UV-free and incorporate multiple wavelengths of light. The colors that you should be on the lookout for include red linked to boosting collagen levels, amber known to calm irritated skin as well as infrared that goes the deepest into the skin layers and works with the other wavelengths to increase the healing efforts. Trophy Skin’s RejuvaliteMD, is an FDA cleared led light therapy device (to target fine lines and wrinkles on the whole face) that let’s you do the anti-aging treatment right from the comfort of your home as an alternative to visiting a professional. 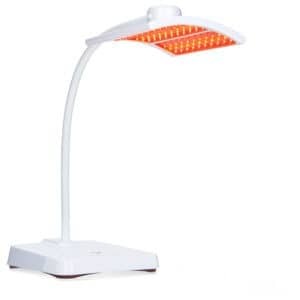 The UV-free lamp has 120 medically-grade LED bulbs, 30 of them are red, 30 amber, 30 yellow and 30 infrared and needs just a 5-minute treatment twice a day for visible results. Two key features that stand out about RejuvaliteMD, is that it is hands free unlike many of the other ones on the market and the timer automatically shuts down the device once treatment is up. Read our in-depth guide to find out more about what the anti-aging benefits of LED light therapy including how it works and what results should be expected.